As illustrated in Figure 1, model layers can be populated by (a) the average log values between the area of interest or (b) the discrete log response of the logs. Figure 1. Both images illustrate the Vs values within a model. Upper image illustrates the ability to block fill a portion of the model with a singular average value defined by a specific depth range within a well. The lower image illustrates how discrete values within a well log can be populated through the Validate model. 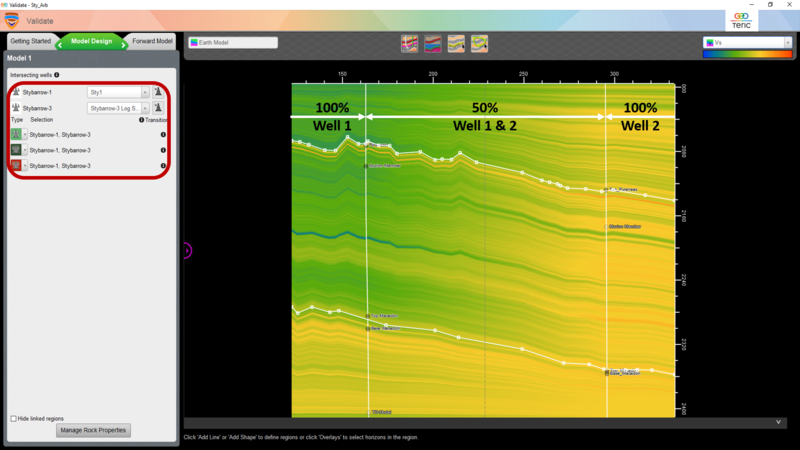 Using the log values will provide an accurate response at the well location, but if there is vertical or lateral variation within the feature, a transition method should be used. Geological scenarios where this is evident could include fining-up sequences or in crevasse splays where vertical and lateral variations change quite drastically. 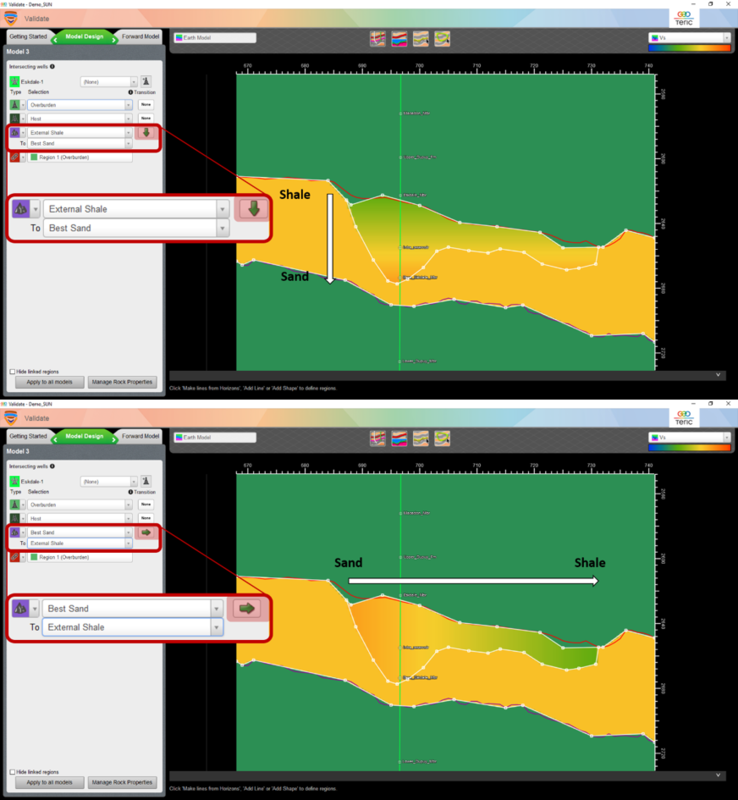 Using this method of populating geological models, allows interpreters to test various geological scenarios quickly with the benefit of not only observing the variable density but also the subsequent RGB colour blend response. This will allow for quick screening and hypothesis testing in Exploration or Development settings. Figure 2. Showing Vs as a rock property in the model design, transitioning vertically and horizontally. After selecting the zone of interest with an associated rock property, the transition option can be used to add a second rock property (to be transitioned into) and a direction to transition into (red box). The above image demonstrates the ability to transition rock property values in the form of a fining-up sequence, where a sandy base transitions up to a shale top. A crevasse splay however may show more of a lateral change in rock properties whereby the channel event maybe more sand based whilst the distal edges of the feature are comprised of a more shaley material. It is also possible to use multiple wells to define changes in rock properties. Figure 3 shows an example where two wells are located within a singular target which appears to have differing values within the logs. By defining each well by its own associated rock property, a weighted averaging method is used to transition the log values between the two wells. Figure 3. It is possible to identify differences in Vs response between two wells. The rock properties above were defined by the associated well’s discrete logs and assigned to the different parts of the model (red box). A weighted average method is used to transition the value response between the two wells, where the mid-point will be equally weighted between the two well log responses. The ability to transition between geological rock properties is an essential instrument with regards to defining more accurate geological models. As geological properties rarely remain a constant in 3D, it is important to have the capability to quickly test different hypothesis to identify which scenarios are more accurate and which can be discarded. 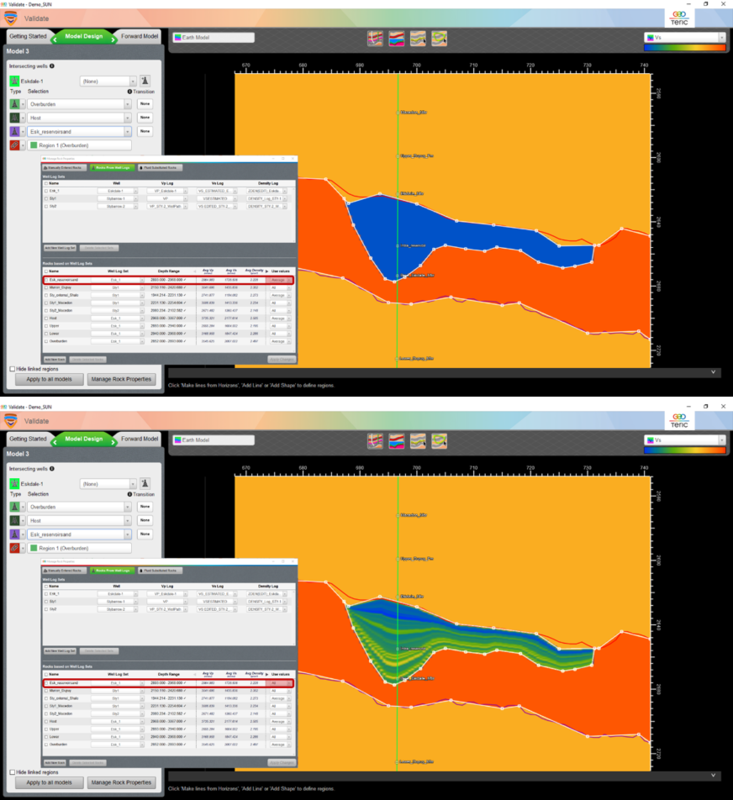 Being able to make these transitions and changes, with the ability to observe the resulting variable density and RGB blends allows an interpreter to get a more accurate match on multiple sources. If both the variable density and RGB blend show a strong correlation to the real life data, it will give the interpreter more confidence that their geological model is more accurate.